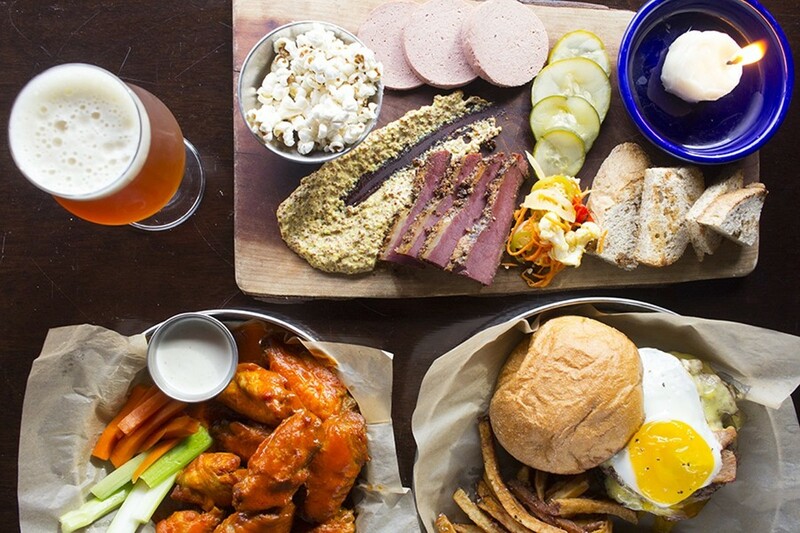 Charleville Brewing Company Hoptimistic IPA's pairs perfectly with a house-cured meat platter, beer-brined wings in buffalo sauce and the "Wake and Bake" burger. When Jack and Joal Russell opened Charleville Vineyard back in 2003 the only beer they cared about were the six-packs their patrons tried to smuggle into the Ste. Genevieve winery. The husband-and-wife team had a policy of not allowing outside booze to be consumed on their property, but that didn't stop the beer drinkers — who mostly came at the insistence of their wine-enthusiast significant others — from showing up with a private stash of suds. Jack Russell saw an opportunity. The vineyard owner had been playing around with home brewing after receiving a kit from his son one Christmas. Since he already had the equipment and a surplus of product, he began offering his beer at the winery and was immediately struck by its popularity. Even after increasing production, he couldn't keep up with demand, finally bringing on seasoned brewer Tony Saballa from nearby Chaumette Vineyard and Winery to help him make beer. In the years that followed, Charleville Vineyard added the label "microbrewery" to its name and became known for its beer as much as its wine — if not more so. Area-wide distribution followed, but the Russells could not help but feel that they had tapped out on Ste. Genevieve's tourist-oriented market. Why not bring their beers, and a brewpub experience, to St. Louis? 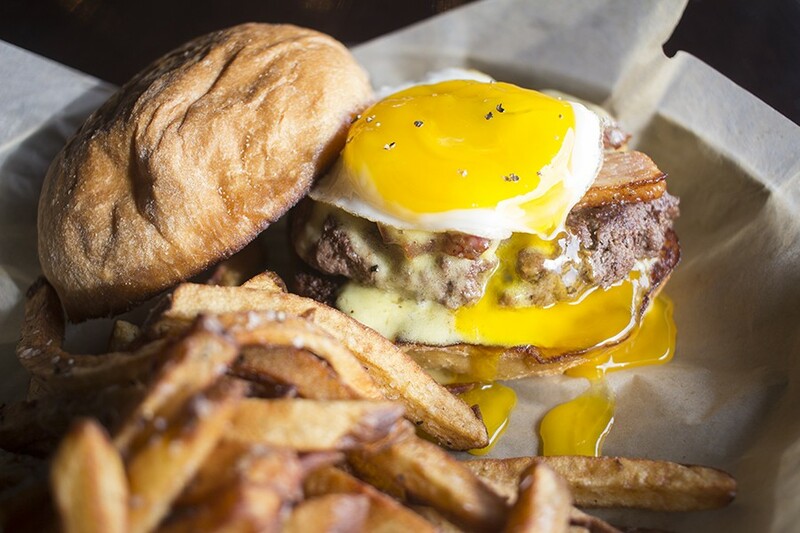 The "Wake and Bake" burger tops an eight-ounce patty with pork belly confit, hollandaise aioli and a sunny-side up egg. There was just one problem with their plan: The Russells did not want to do food. Granted, falling into beer had worked out well for them, but they knew better than to open a restaurant with zero experience. Fortunately, they had friends in the industry who were seasoned veterans in that department, Paul and Wendy Hamilton of 1111 Mississippi, Vin de Set and Moulin Events (among other successful ventures). With the Hamiltons on board, the partners at first entertained the idea of opening a small window inside the brewpub so patrons could grab food at their leisure. However, as their plans took shape, they decided upon a full-service concept, opening Charleville Brewing Co. & Tavern this past May. One catalyst for the full-service concept was the space itself. 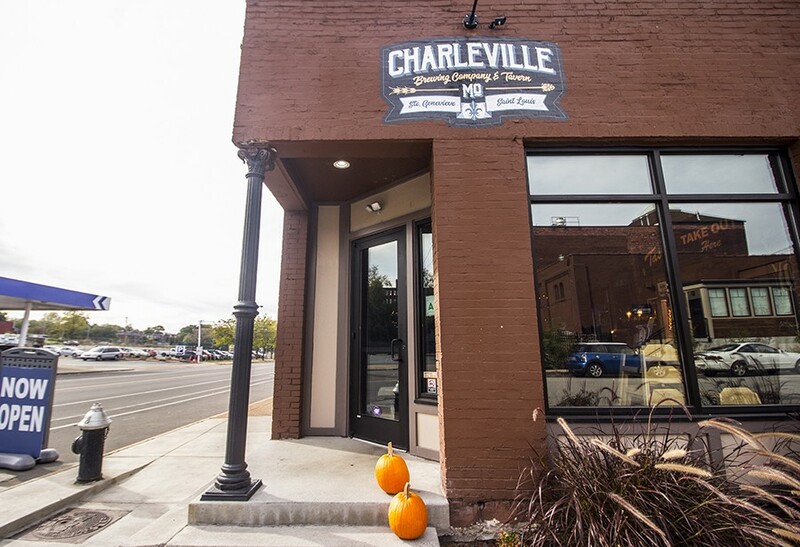 The large, open room that houses Charleville Brewing Co. sits on Chouteau Avenue across a side street from Vin de Set. 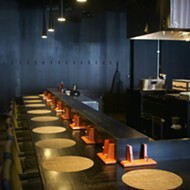 Alone, it seats at least 150 people; add in the patio, and capacity can reach 200 guests. For the Russells, the thought of trying to accommodate that many people out of a small food window seemed like a recipe for disaster. They settled on a traditional brewpub concept that would allow their patrons to sit back and drink beer — not stand in line — while waiting for food. 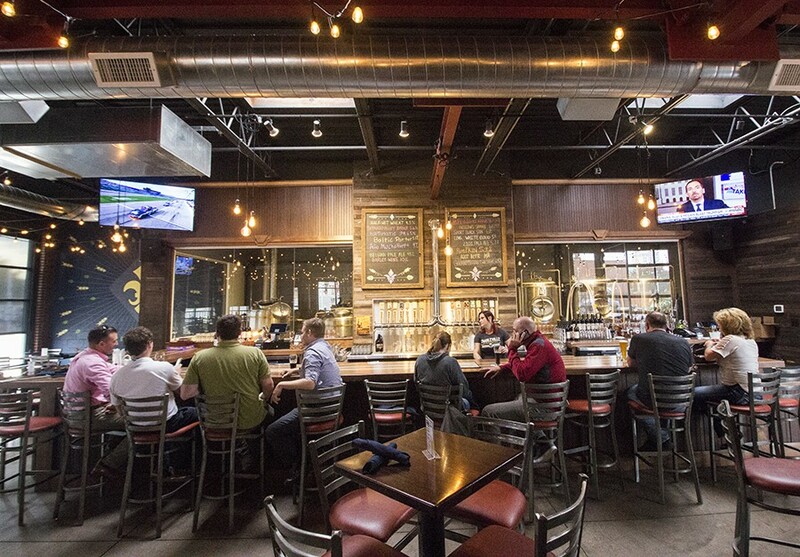 Indeed, Charleville Brewing Company is a place to relax, a comfortable space that the Russells and Hamiltons dramatically transformed from its former life as an engine repair shop. When they took over, the building was windowless, caked in grease and pocked throughout from industrial-strength acid. You'd have no idea of that history walking into the current digs, however. The warm space has glossy new cement floors, huge windows that look out onto Chouteau and a massive wooden bar and tasting counter that runs nearly its entire length. Exposed brick and beams and St. Louis-inflected décor, including a fleur de lis and an original city plan, decorate the walls. The bar and brewery occupy a multi-tiered space right across a side street from the Vin de Set complex. Moulin executive chef Ryan Luke and Charleville Brewing Co. chef Matthew Allsup created a menu that combines the sort of hearty tavern food you'd find in a British Isles pub with comfort specialties straight out of a Southern grandma's kitchen. 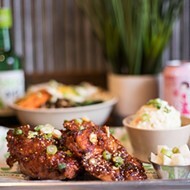 It's not all folksy fare, though: Some twists give the food a cosmopolitan touch, like the tangy Asian glaze coating the plump, beer-brined chicken wings. The sweet and spicy sauce is like the best parts of the Korean hot paste gochujang and a sweet and tangy barbecue sauce. It's a beautiful marriage of styles. Instead of the usual hot dogs, too, the corn dogs at Charleville Brewing Co. are filled with lobster meat and garnished with a crisp sweet and sour slaw that cuts through the deep-fried richness. The taste is a Maine summer carnival. The "South Side" fried chicken livers benefited from a bright carrot and cilantro slaw and fiery sriracha aioli. However, the texture was tough and dry, possibly the result of being cooked a bit too long, though they arrived after our entrees. Perhaps they had been sitting in a window. It's a pleasant enough idea that would work if better executed. 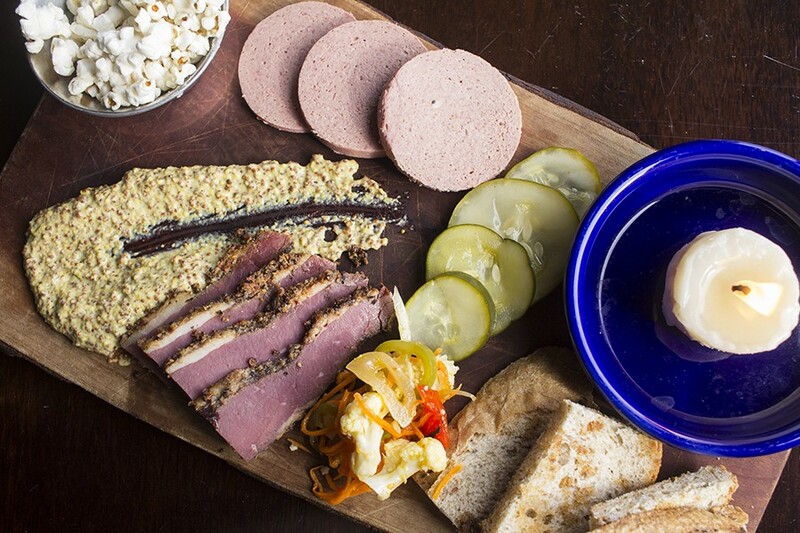 The house-cured meat platter features pastrami and braunschweiger, with pickles, giardiniera, and bacon-fat popcorn. Bruschetta, a reliable crowd pleaser, comes in several styles, and guests are encouraged to mix and match from a selection that includes a wonderfully pungent goat cheese topped with roasted red peppers and whole cloves of soft, roasted garlic. The earth and tang from all components work in beautiful concert. The brie and apple butter is an equally worthy selection, and I appreciated the texture that the spent grain granola garnish added — though the cranberries in the granola added a bit too much crunch. They were like rock candy. Flavor-wise, though, it's a delicious and classic combination. Charleville's hand pies may be its best menu offerings. 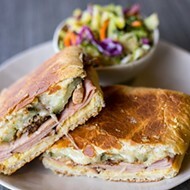 The flaky, fried pockets are somewhere between a biscuit and an empanada. The "Chouteau Shepherd" version is a fun riff on a shepherd's pie, filled with ground beef, potatoes, corn, peas and onions. It's delightful, though the version that blew me away was a veggie option, stuffed with black bean and sweet potato. The spicy concoction gives off the same fiery perfumed flavors you get from biting into a samosa at an Indian restaurant. I can't think of anything I'd rather pair with the brewpub's wonderful beer. 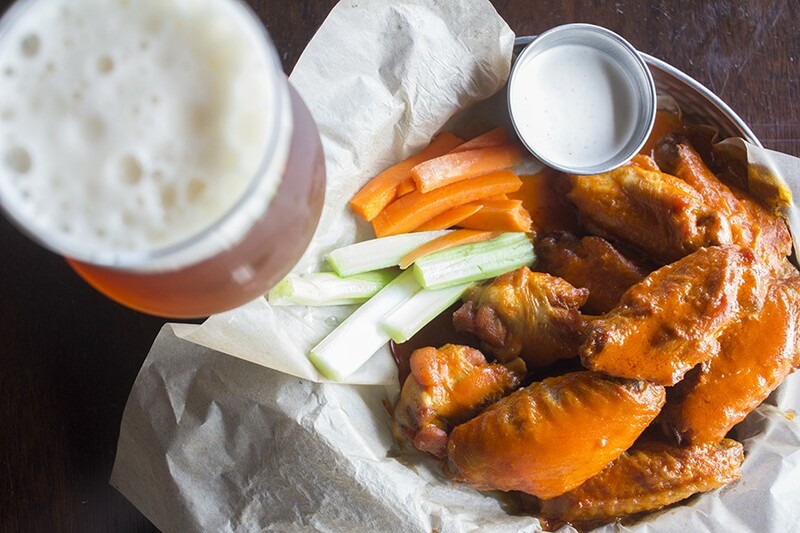 Beer-brined wings are fried, then topped with classic buffalo sauce. Chefs Luke and Allsup wanted to up Charleville's sandwich game by offering familiar options with distinct toppings. A simple pulled chicken sandwich is anything but with its peppered goat cheese spread, tangy chimichurri and giardiniera toppings. The spice is subtle, but it creeps up nicely. Likewise, instead of a standard pub burger, Charleville's signature is the "Wake and Bake," a plump ground beef patty topped with tender pork belly, a sunny-side-up egg and hollandaise sauce. When the salt and pepper that seasons the ground beef is your relief from the richness, you know it's an up-to-the-edge decadent dish. 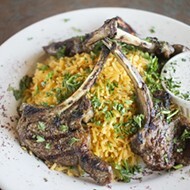 Entrees are equally hearty and well executed. Meatloaf, liberally seasoned with Thanksgiving spices, is made from beef, pork and lamb, then wrapped in bacon. A ketchup and balsamic glaze enlivens the dish. 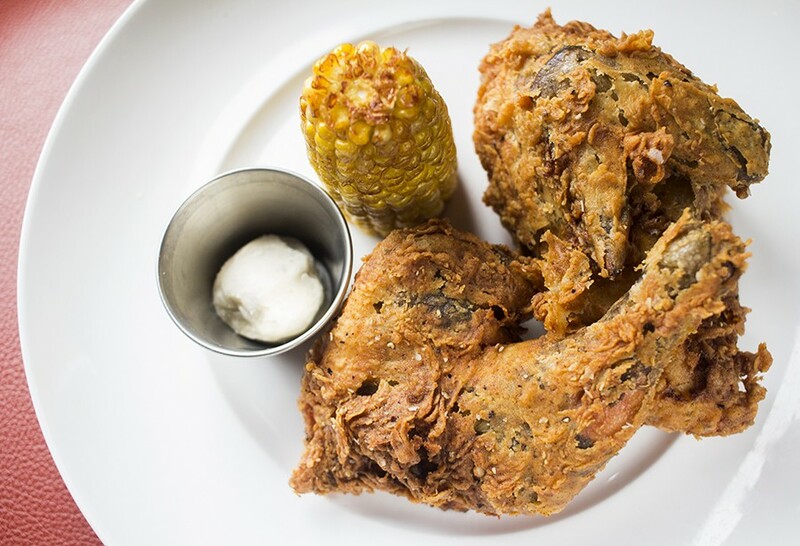 Chef Luke's specialty, fried chicken, is both smoked and fried, infusing the meat with earthy flavor that adds dimension to the pleasantly straightforward salt and pepper breading. Both come with rustic mashed potatoes laden with so much butter, they take on the color of the noonday sun. One highlight: the cherrywood smoked chicken with corn on the cob and smoked sea-salt butter. My favorite main course is the house-smoked pastrami, a dish that tastes like what would happen if Austin seceded from the state of Texas and plopped itself in the middle of Manhattan. Fat-striped brisket is smoked to the point of almost falling apart, its Texas-style crust replaced with coarse black pepper. It's Katz Delicatessen in cowboy boots. Why you'd want to end on anything but this glorious note is questionable, though a molten s'mores brownie baked into an individual cast iron skillet is appropriately enticing. And for those of us who believe the crust is the best part of a pie, an individual apple crumb version is a satisfying end to an evening. 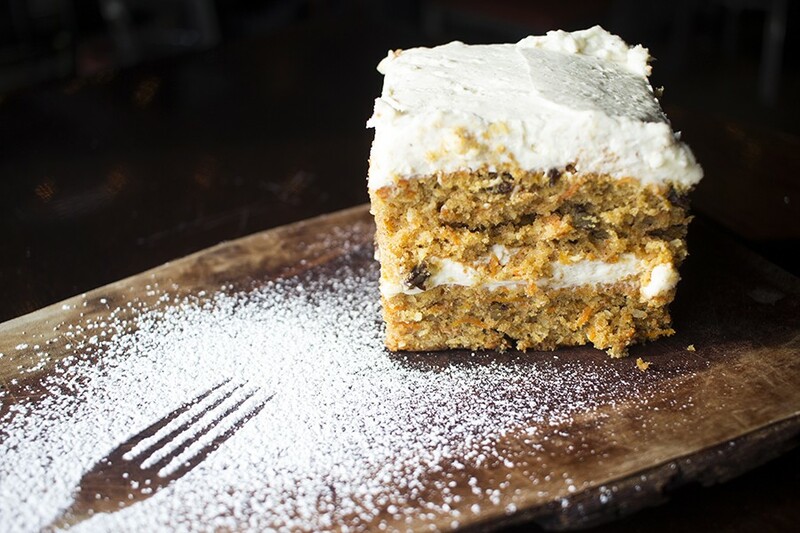 For dessert, Charleville offers carrot cake with cream-cheese icing. If you didn't know anything about the beer and wandered into the Charleville Brewing Co. for a bite to eat, you'd have no idea the food side of the operation came second. The Russells may not have envisioned themselves as restaurateurs. Then again, way back, they didn't even envision themselves as brewers. It's funny how they have a way of stumbling into success. 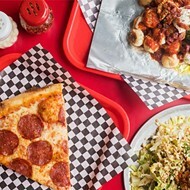 And these days, they certainly don't have to worry about folks trying to sneak anything into their delightful restaurant — except a very healthy appetite.